Celebrating tennis and fashion for 60 years! Celebrating Fred Perry’s 60th Anniversary, Asylum was one of the 60 personalities that paid tribute to the iconic laurel adorned and tipped collar polo-tee. 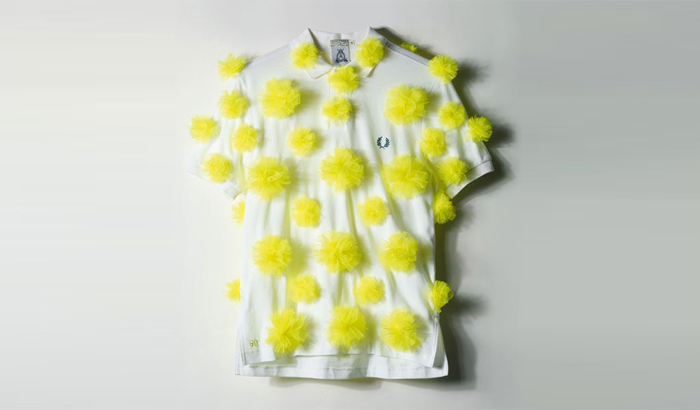 With a fun and quirky throwback to the roots of the brand, hand sewn neon yellow pom-poms create a splash of colour against the classic white tee, resembling tennis balls with a festive touch. A total of 60 pom-poms were used, marking the significant milestone of the heritage brand. Other notable t-shirt contributors include Wing Shya (Hong Kong), Terry Hall (UK), Mother (UK) and Geoff McFetridge (US).